Most of my time is spent around geeks who keep introducing me to cool stuff that I don’t already know about. It was 2017 when I first heard about the “very cool” Mi Sports Sneakers from some overly-impressed colleagues at my office. I looked it up on the internet and the shoes genuinely looked quite amazing for the price. I was impressed, but not blown away like my colleagues who saw it during their China trip. After a couple of months, I met Jai Mani, Product Head, Pocophone Global. He was wearing the same shoes I read about on the internet, and from that distance, they looked nothing less than a pricey Nike sneakers. I kept noticing the shoes throughout the meeting and of course, I finally asked him about them to be sure. From the design to the quality of material and finish, everything seemed really impressive for the price. By that time, I knew I am going to buy these from China as I wasn’t sure they’ll be coming to India. As expected, the first gen sneakers didn’t make it to India, but the new and improved Mi Men’s Sports Shoes 2 are now available for purchase for Rs 2,499. The shoes will be available on Xiaomi’s crowdfunding platform from February 6, with an early bird offer starting at Rs 2,499 and shipping starts from March 15. Since it’s from Xiaomi, many would be wondering if it comes with some tech inside it, but it’s a not a smart shoe. It doesn’t come with a chip in the sole, LEDs or self-lacing tech, but it does follow Xiaomi’s smart design and quality material philosophy. Why is Mi Men’s Sports Shoes 2 is a great deal? The best part about the Mi Sports Shoes 2 is that at less than half of a regular sneakers cost, it offers a combination of comfort, style, and durability. The on-feet look of the shoes can rival most premium shoes from mainstream shoemakers. It is manufactured using a uni-molding process which uses 5 separate layers and materials to make the sole. Instead of regular manual glue combination, the company presses and binds the layers using a thin polyurethane film with a mold. This process ensures a cleaner finishing and also reduces the possibility of glue opening up. The company says this process also provides better stability and support to the feet. The midsole is made of special material that makes it more resilient and reduces deformation. 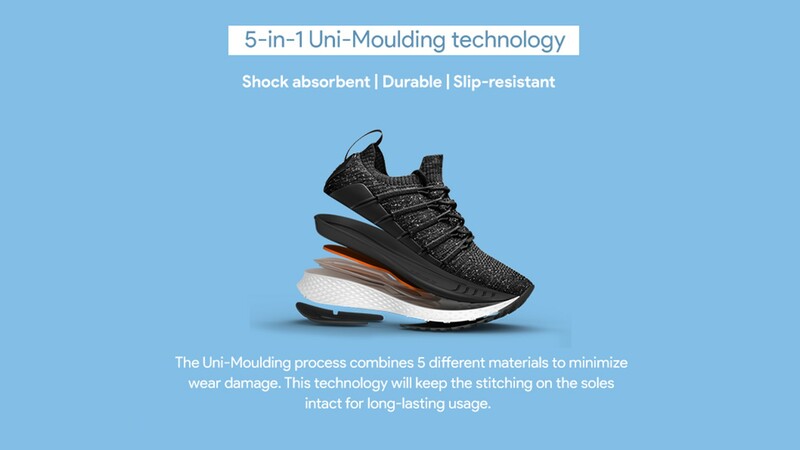 The top of the shoe is crafted using a high-elastic knitting process with a fabric mesh that is breathable and washable. You can literally wash these shoes in the washing machine without the fear of it getting damaged. Furthermore, the fishbone structure helps it provide a good fit and comfortable cushioning while dealing with accidental sprains. The Mi Men’s Sports Shoes 2 will be available in Black, Dark Grey, and Blue colors. The company had mentioned that the shoes will be available on its crowdfunding platform for now, which means they might soon hit the Mi store as well. Also, Rs 2,499 is said to be the early bird price, the original price being Rs 3,999. For those who were waiting, this is the best time to book the Mi Sports Shoes 2.